The silent fight for supremacy of the EV -SUV begins. Two years ago, the German luxury brand Mercedes-Benz had decided to conquer the emerging market for electric SUVs, with what they called the "EQC". 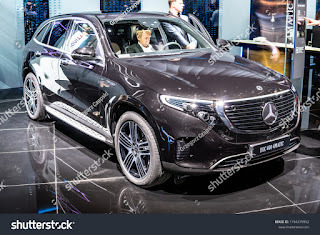 It would be the SUV for anyone looking for an incredible performance (like from an electric car), offering immense functionality and cutting-edge technology that are neatly packaged in a recognizable and soothing Mercedes package that everyone would love. At an event in Sweden, Mercedes has taken over the production maturity of the EQC SUV, which is not only the first all-electric SUV from Mercedes-Benz, but also the first product of its new electrified sub-brand EQ. Not only is it a precedent for any future EQ model, it also puts Mercedes-Benz in competition with players like Tesla, with its Model X (which breaks the niche) and the award-winning Jaguar I-Pace. If you like the EQC a bit like the GLC, we'll tell you now that there's a reason. The EQC rides on a 2873mm wheelbase identical to the GLC, although the electric SUV is slightly shorter but slightly wider. The reason for the almost damned measurements is basically: EQC runs on a new all-electric EVA platform, but EVA is "inspired" by the MRA platform, which supports the GLC class. It also helps that the GLC class is one of the most popular SUVs of the brand: If the version with internal combustion sells well, this should be the electric, right? Under the skin is a 80 kWh battery, slightly smaller than the Jaguar I-Pace (90 kWh) and the upcoming Audi e-tron (95 kWh). The driving force is 300 kWh and 765 Nm. Thanks to a twin-engine setup with one motor on each axle, all four wheels are driven. Despite its weight of nearly 2.5 tons, the EQC reaches a speed of 100 km / h in only 5.1 seconds and offers a range of 450 km (more than 450 km / h) according to the NEEDC cycle. That's not bad, and the integrated high-performance DC charging system also allows the EQC to charge 10% to 80% in just 40 minutes with a 110 kW fast charger. Charge it at home and this will take a long time due to the much lower, slower charging power of 7.4 kW. However, the use of a Mercedes-Benz Wall box triples. Enter and you are immediately welcomed by a unique cockpit experience, both foreign and equal to that of current Mercedes-Benz owners. Next-generation Class A owners will immediately recognize Mercedes-Benz's new user interface, MBUX, which powers the big-screen displays in front of the driver and above the center stack. Saying "Hey Mercedes" will trigger the AI-powered speech recognition software, which is similar in execution to Siri and Amazon Alexa. However, as this is the first time that MBUX has been used in an EQ brand electric model, Mercedes has developed unique features for the system, which display information such as charging speed, power consumption and suggested departure times based on navigation entries. The navigation will also show you charging stations, which will be automatically integrated into your route if the distance you wish to travel exceeds the projected range of your battery.